Do you remember years ago, the advice was no more than three eggs per week? Seems crazy now, and let’s not even get started on the fear of salmonella! These days, we credit eggs (the high quality I might add) with being amongst the healthiest foods you can eat, and there’s no limit (as per the NHS website) on how many we should consume as part of a healthy diet. Good news for me, you, everyone! I eat eggs every day, mostly for breakfast, they just hit the spot. I’ve never been much into cereal, I sometimes have porridge during winter made with water though as I don't care for milk, even non-dairy. Eggs are a staple and always have been, even as a teenager (ignoring the 3-per-week advice and couldn’t cook to save my life) I could do a mean scrambled eggs. It was my signature dish! 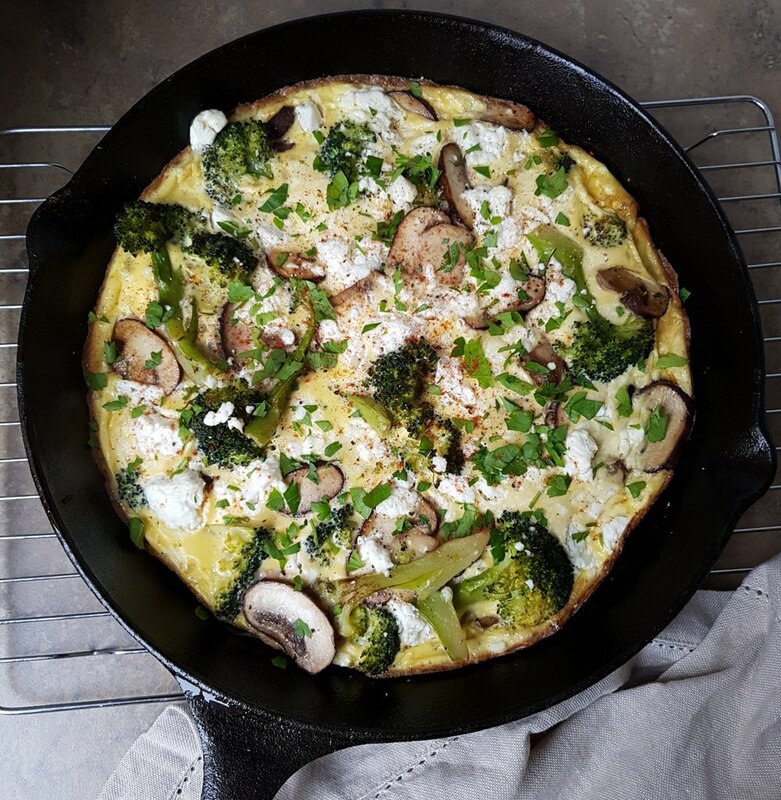 Today I’m sharing a Ferguson family favourite, an extremely flexible vegetarian recipe suitable for lunch, dinner and absolutely breakfast too - Mushroom, Broccoli and Feta Frittata. Turn on the grill to high. Beat the eggs with a splash of milk. Boil or steam the chopped broccoli. Chop the parsley and set all of these aside. Fry seasoned, sliced mushrooms in a hot skillet pan with olive or rapeseed oil, once cooked add a little touch of butter for taste if you wish. Add the broccoli to the pan, turn in the heat for a minute or two. Add the egg mix and slightly mix as you would an omelette to help cook the eggs evenly. Once the eggs are starting to set, (check by lifting the frittata with a spatula, if it’s holding firmly then it’s set) sprinkle feta cheese on top and place under the grill for a few mins. Remove from the grill and sprinkle with chopped parsley, some sweet paprika and serve. Prep is the key for this recipe, the eggs will cook at lightning speed, ensure all the components are ready to use. Also, make sure your oiled pan is suitably hot and the grill too. But equally, be careful to watch the frittata when it's under the grill, depending on how powerful your oven is, it's easily over-cooked. I use an iron skillet, but any good pan will do, remember as it’s going under the grill not to use one with a handle which can melt! This recipe is especially great for leftovers, mix it up and use what you have. I like a bit of spice alongside my eggs so I tend to serve them with a quick tomato, red chilli and parsley salsa. There’s something just perfect about the combo! Let me know what you think of this recipe and I most definitely would appreciate a tag on Instagram or Twitter if you fancy posting a picture of your creations. I’ll be back soon with a spicy shakshuka, perfect for lazy winter mornings now the weather has cooled.